In Box 1, the amount of Qualified Tuition and Related Expenses (QTRE) paid on the student account during the tax year. In Box 5, the amount of Scholarships and Grants posted to the student account during the tax year. You, or the person who may claim you as a dependent on their federal tax return, may be able to claim an education tax credit or deduction on Form 1040 or 1040A for QTRE paid during the year. Receiving Form 1098-T does not guarantee that you qualify to claim an education tax credit or deduction. Please note, University of Pittsburgh staff can only answer questions related to how Form 1098-T was prepared. Each taxpayer should refer to IRS Publication 970 or consult with a professional tax advisor for explanations relating to the eligibility requirements for education tax credits and deductions. Online resources to assist you are included at the bottom of this webpage. Log into PittPAY using the appropriate login button at the top of this website. Heartland ECSI is the University of Pittsburgh’s 1098-T processor. You will be notified by email, on or before January 31, from webmaster@ecsi.net when your form is ready to be accessed on the Heartland ECSI website. You will also be able to select the Quick Link “View your 1098-T” on the Account Summary tab in PittPAY to be directed to the Heartland ECSI website to view and print your form. Click + to open your form. Click View/Print Statement. Be sure your web browser’s pop-up blocker is turned off to allow pop-ups from the Heartland ECSI website. You can view your form online or print it from your web browser to keep for your records. There is no need to attach Form 1098-T to your tax return; the information is filed with the IRS, electronically. Payments made by cash, check, electronic echeck, or credit/debit card. Payments made from federal or private educational loans posted to the student account. Payments made with scholarships or grants from any source posted to the account, unless the award was specifically intended to pay a non-qualified charge. Payments from 529 and College Savings Plans. The date a payment is applied to a qualified charge is what matters for Box 1, not the date that charges are posted to the student account. Payments that apply to qualified charges during the tax year are included in Box 1. Payments that apply to non-qualified charges are excluded from Box 1. With very few exceptions, we have made sure that payments apply to qualified charges first, unless we are instructed to apply the payment to something else, like room or meal plan charges. (This is true of some grants and scholarships that Pitt students receive). After we have used up payments to be applied to qualified charges (QTRE), we apply them to non-qualified charges (non-QTRE). Course and program fees that are required as part of a degree seeking program, if they do not cover the cost of travel or living expenses. Are expenses for books considered QTRE? Whether the cost of books is a qualified expense or not depends on the specific education tax credit or deduction you wish to claim. For this reason, Box 1 does not include amounts paid on your student account for electronic course materials/books. You should consult with your tax advisor to determine if payment for these items should be considered when preparing your income tax returns and determining eligibility for education tax credits or deductions. In the past, colleges and universities had the option of reporting QTRE paid in Box 1, or QTRE billed in Box 2. For 2017 and prior, Pitt reported QTRE billed in Box 2. Beginning with tax year 2018, Pitt reports QTRE paid in Box 1. This reporting change does not impact what you may be qualified to claim as an education tax credit or deduction. 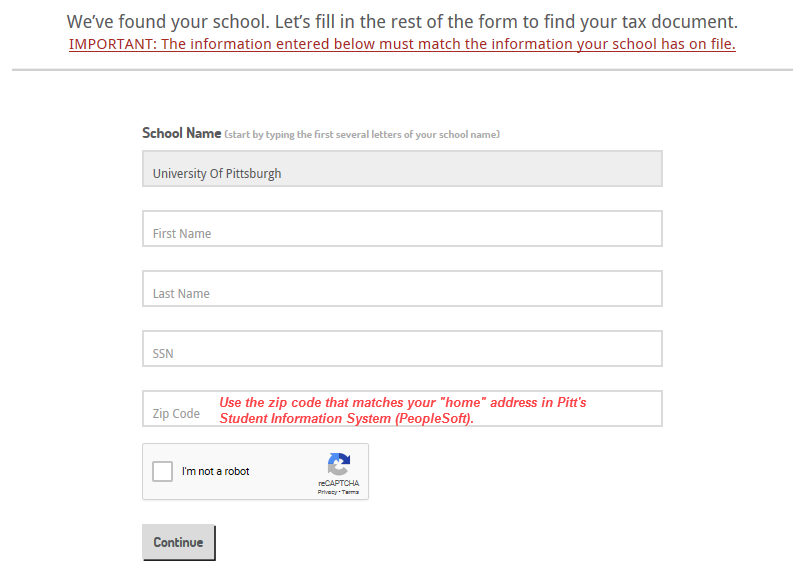 It only impacts how colleges and universities report QTRE on Form 1098-T. All institutions, not just Pitt, must now populate Box 1 because the IRS no longer permits Box 2 reporting. Box 5 identifies the total scholarships or grants posted to your student account during the calendar year. In compliance with IRS regulations, the value you will see in Box 5 will be the sum of ALL grants and scholarships, even those that pay charges that are not QTRE. Federal Pell, SEOG, and other grants. Scholarships that cover the cost of attendance, including the cost of tuition, housing, and meal plans. Scholarship checks received on behalf of the student from outside organizations such as civic and religious organizations, nonprofit entities, employers, and others. Veterans’ benefits where the VA makes payment directly to the institution. Loans, including Direct Subsidized, Unsubsidized, and PLUS Loans, private/alternative loans, institutional loans, and Health Profession loans. Work study awards, since this is earned income. Veterans’ benefits where the VA makes payment directly to the student. 529 and College Savings Plan payments. Education benefits received by Pitt faculty, staff, spouses, domestic partners, and dependent children may be partially or fully taxable. The non-taxable portion (if any) is included in Box 5, Scholarships or Grants. The taxable portion (if any) is excluded from Box 5, but may be included on Form W-2 or other tax form. Box 4 includes adjustments to the amount of QTRE that was paid and reported in Box 1 for any prior tax year. Box 6 includes reductions to the amount of scholarships or grants that were reported in Box 5 for any prior year. Box 7, if checked, indicates that Box 1 includes payments received for QTRE for an academic period that begins in January through March of the next calendar year. For example, if you paid for spring 2019 QTRE during November 2018 or December 2018, this box will be checked. Box 8 shows whether you are considered to be carrying at least one-half the normal full-time workload for your course of study for at least one academic period during the calendar year. Box 9 shows whether you are considered to be enrolled in a program leading to a graduate degree, graduate-level certificate, or other recognized graduate-level educational credential. When we issue Form 1098-T, we are required by federal regulation to include the student’s Social Security Number (SSN) or, for eligible international students, the Individual Taxpayer Identification Number (ITIN). If this information is not available in the University’s student system, regulations require us to annually request that the student provide this information. If the student is eligible to receive a Form 1098-T, but has not provided the University with the SSN or ITIN, we are required to issue the form without it. The IRS may fine the taxpayer if a 1098-T is issued without the student’s SSN or ITIN. Information is missing or incorrect on my 1098-T. Can I have a new one? The SSN or ITIN and the address on the 1098-T were obtained from information provided by the student to the University of Pittsburgh. The address on the form is irrelevant for IRS income tax filing purposes. If your address is incorrect, there's no need to request a corrected 1098-T. However, the single most important information is your SSN or ITIN and it must be correct. 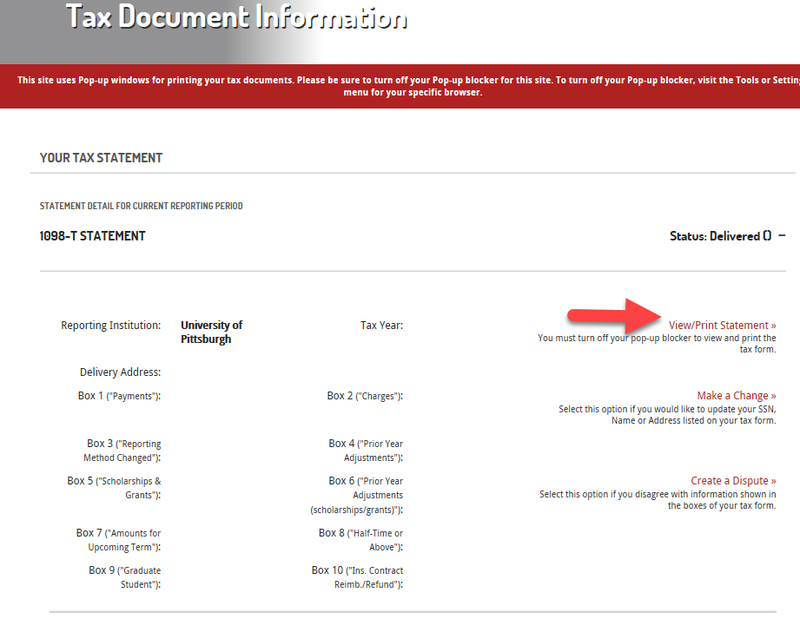 If it is blank or incorrect, follow these instructions to have your SSN or ITIN updated in the student system, so the University can issue you a corrected Form 1098-T. Complete only PART I of IRS Form W-9S at http://www.irs.gov/pub/irs-pdf/fw9s.pdf. Print the form, then mail, fax, or personally deliver it to the Registrar’s Office for your campus (listed below). For security reasons, email requests are not acceptable so please do not email the form to your registrar’s office. The Registrar’s Office will update your SSN or ITIN in the student system; allow several business days for normal processing time. Check the Student System to see when your SSN or ITIN has been updated: Log into MyPitt at my.pitt.edu and select “Student Center.” Navigate to Self Service, then Student Center. Find the Personal Information section and select Demographic Data to view your SSN or ITIN. A note that your SSN or ITIN was updated in the student system and you need a new or corrected Form 1098-T.
Make sure your web browser’s pop-up blocker is turned off, so you can view and print your tax document. When your form is ready, you will be able to view and print it online. If the form is not ready yet, check back in one to three business days to allow the Student Payment Center time to process your request, or email them at payments@pitt.edu with your student ID to check on the status of your request. Heartland ECSI at 866-428-1098 from 7:30 AM to 8:00 PM EST, Monday through Friday, or visit their online Help Center at https://heartland.ecsi.net/index.main.html#/contactus to start a live chat. Submit Form W-9S to your campus registrar in person or by mail or fax. For security reasons, please do not send the form by email. I am not a U.S. Citizen. What does IRS Form 1098-T mean to me? The IRS does not require the University of Pittsburgh to file a Form 1098-T for international students who are not US residents for tax purposes. This is because non-resident alien students are generally not eligible for education tax benefits. However, the University cannot definitively determine which international students are residents for tax purposes. Therefore, we provide form 1098-T to international students who have a valid ITIN or SSN in our student system. For more information, view IRS Publication 519, U.S. Tax Guide for Aliens. The amount of QTRE paid during the tax year from January 1 to December 31 was zero. For example, you were enrolled for the spring term that begins in January 2018, but you paid your tuition and fees for the term in November 2017 or December 2017. You paid your tuition and fees during the calendar year, but dropped all your classes during the same calendar year. All your charges were reversed and your money was returned to you. You will not receive a 1098-T form. Students who paid interest on a qualified loan administered by the University of Pittsburgh will receive IRS Form 1098-E in January. The form is issued by our vendor, Heartland ECSI, and can be obtained online at www.heartlandecsi.com. You will need your SSN and password, and the University of Pittsburgh’s school code, which is W2. If you don’t have a Heartland ECSI password, please contact Heartland ECSI at 888-549-3274 for assistance.